After fifteen months of intense activity, I am now leaving the NHS International Development Team in Healthcare UK: great people, a fantastic job and an organisation with a bright future ahead. As a Projects Adviser I have been able to build and manage high-level relations with managers and chief executives in key NHS Trusts around the country. Together with the team I developed a growing network of NHS provider organisations – currently one quarter of all of England’s Trusts – all willing to explore international commercial opportunities and to share their knowledge with emerging countries, leading the global change in health systems. And in this journey Healthcare UK is the best partner for the NHS: we already are unleashing the transformational power of the NHS in new economies, fostering better, more accessible and fairer healthcare systems where they are most needed. The NHS is in very high demand indeed. The challenge is not to find the opportunities - there are billions of pounds worth of opportunities. The challenge is to build the NHS supply chain to meet that demand. My role was to promote services and digital technologies made in Britain and, by doing so, learning valuable lessons that would not otherwise be tested in the UK, and also delivering an alternative stream of revenue for our National Health Service. And we are now entering a new phase: Healthcare UK is launching a programme of support for NHS provider organisations, with training sessions all around the country. Our target is to consolidate our network and equip its members with the necessary knowledge to enter overseas markets with their international commercial offers. The organisations attending our support programme will get an opportunity to understand what the current NHS baseline for international engagement is and to ask questions to top-class market advisors working in key Embassies. We provide the NHS with a firm understanding of strategy development, business models and risk management, and then we review progress and impact against each organisation so we can tailor our support. 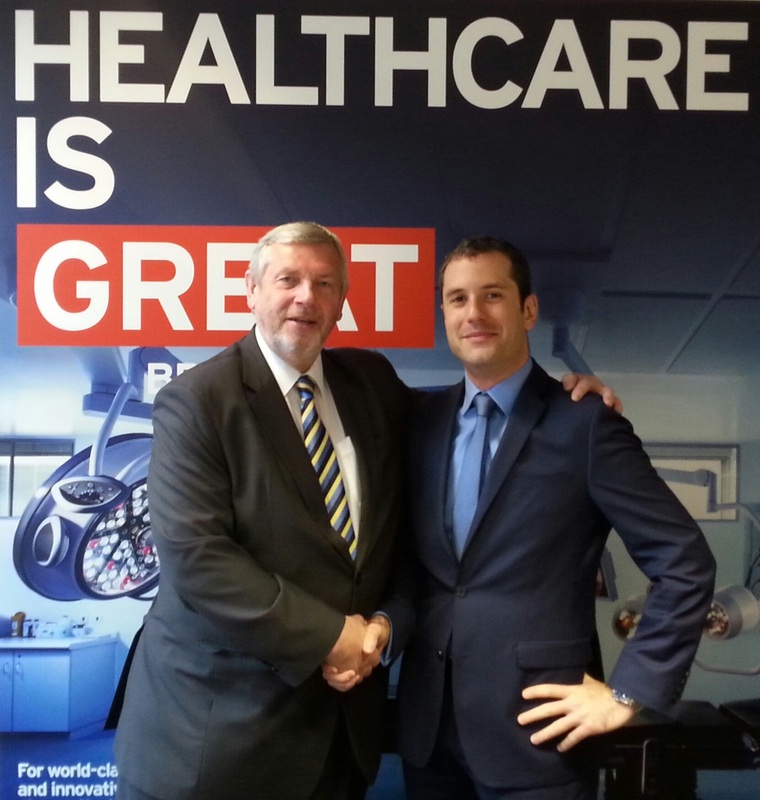 At the same time, Healthcare UK keeps building agreements with overseas governments to facilitate the NHS international activity as well as working closely with UKTI to identify local business opportunities. In brief, we provide the NHS with a bold, yet possible, alternative to revenue generation, and we make it possible for our providers to deliver on it to ensure better and competitive care in the UK. Together with all of this Healthcare UK gave me a lot of other fantastic opportunities, including the lead in organising our presence in EXPO Milan, where Healthcare UK, the UKTI Life Sciences Organisation and the Department of Health are to launch together, The Future of Health, a two-day initiative that will take place in Expo Milan on 29 and 30 September 2015. Healthcare UK will lead on the first day, promoting thought leadership sessions on digital health, genomics and infrastructure with high-calibre speakers such as Tim Kelsey, Sir John Burn and Andrew McNaughton. More importantly, our presence at EXPO Milan will be an opportunity to connect the best of the UK healthcare with international buyers from markets such as – among others – China and the UAE. The Milan Expo will follow closely the NHS England Health & Care Innovation EXPO in Manchester on 2 & 3 September, and Healthcare UK is looking forward to what will prove to be a very busy autumn indeed, with plenty of chances to put NHS organisations in touch with commercial leads. So this post is a farewell to an organisation that clearly has a lot of work to do and a clear objective to fulfil: increasing the global revenues of the NHS to contribute to international development and to deliver better care into the UK. Coming from overseas, this job was also an opportunity for me to learn more about the NHS and the treasure it represents to everyone in the UK - an organisation delivering the best care in the world and yet free at the point of access since 1948. This is why I am proud of the NHS.